Mitt Romney, the former Massachusetts governor and 2012 Republican presidential nominee, is planning a Senate bid to replace retiring Sen. Orrin Hatch in 2018, according to three individuals close to the situation. “He really feels like there’s this moment where he has some work to do,” the individual said. Additionally, the former governor changed his location from Massachusetts to Utah on Twitter not long after Orrin Hatch announced his retirement. If he does run, Romney is practically a shoo-in to win. According to Gallup, only Wyoming gives Republicans a larger lead in party identification than Utah. No politician is more popular in Utah than Romney, and given his financial resources and heavy lead in opinion polling, mounting any opposition to him seems futile. This Senate seat is Mitt Romney’s if he wants it, and a credible journalist with plenty of sources on the right is now reporting that he does want to succeed the longest serving Republican in Senate history. 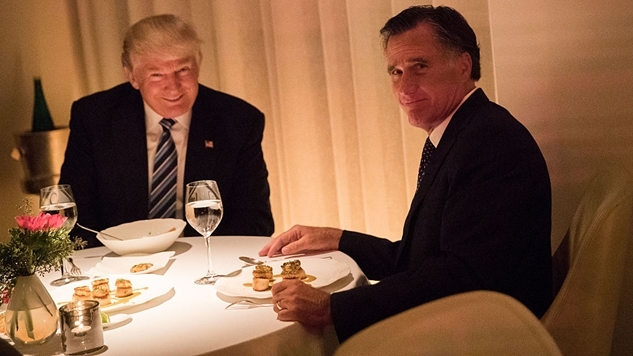 The photo at the top of this story is Trump’s infamous dinner with Romney where he wanted him to beg to become Secretary of State, and was likely just another opportunity for the president to humiliate a political opponent. What would make Senator Romney interesting is not just his public anti-Trump stances (granted, plenty of GOP Senators have publicly denounced Trump, only to enact his agenda), but the fact that his niece is the GOP chairwoman, Ronna Romney McDaniel. She has come under fire for leading the GOP’s open embrace of Trumpism—especially in the wake of Roy Moore’s loss in Alabama—and this clip is a hint of the awkwardness that could ensue should her uncle serve in the Senate.